Way back in 1903, Sir William Crookes was experimenting with the most expensive material on Earth at the time... Radium Bromide. Working in total darkness, he accidentally spilled a small quantity on a thin layer of a special type of activated Zinc Sulfide (ZnS). To make sure he recovered all of the expensive Radium Bromide, he used a magnifying lens to locate every single speck of it. To his amazement, he noticed flashes of light occurring around each tiny grain of the radioactive material. It was found that the flashes of light were caused by the individual Alpha particles emitted from the Radium compound, striking the activated Zinc Sulfide. 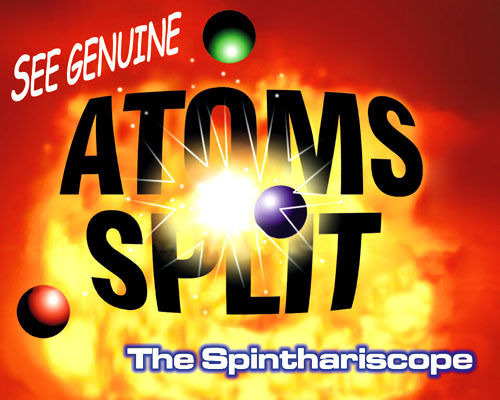 The flashes of light were individual photons emitted from splitting atoms. Crookes was indirectly able too 'see' radiation via the light flashes. Shortly thereafter, he assembled a small apparatus with a tiny radioactive Radium source, Zinc Sulfide screen, and magnifying lens. He called the device a ' Spinthariscope '. The Spinthariscope can be considered the first radiation detector. Spinthariscopes were popular items back in their day but they have long since disappeared and been forgotten. 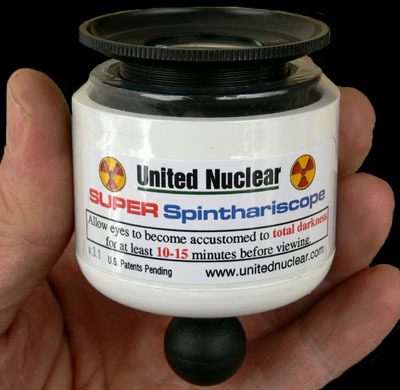 In the mid 1990s, United Nuclear Scientific designed a new Spinthariscope using modern materials and brought the classic Spinthariscope back to life. Our Spinthariscopes do not contain any dangerous Radium Bromide. Instead, they contain a tiny speck of extremely high grade Thorium ore, specially mined & imported for us from the Great Bear Lake in Canada. The high Thorium content makes this Canadian ore very unique in its chemical composition, and is the only natural occurring radioactive material that will put on the dazzling nuclear display you see in the Spinthariscope. The small speck of radioactive material is permanently sealed within the device and does not pose any health or radiation risk. The tiny radioactive source is encased in a metal tab and permanently bonded within the unit. The target material is a special form of Zinc Sulfide (ZnS) that is heated to 1500 degrees in the presence of pure Silver vapor. This process makes the ZnS glow when hit with Alpha particles. As the source material undergoes natural radioactive decay, atoms of it continuously explode, releasing Alpha Particles traveling at over 20,000 miles per hour. Even at this high speed Alpha particles can only travel a little over an inch in the air.... and can't even penetrate a sheet of paper. They can however hit the ZnS target suspended directly above the source. When an Alpha Particle hits the ZnS target, it releases a photon, the basic component of light. This produces the thousands of tiny flashes (scintillations) of light you see through the lens. Our Spinthariscopes features an adjustable focus, requires no batteries or any other form of energy, and will continue to operate producing tiny visible nuclear explosions for at least 60 years. the handheld Nuclear Spinthariscope is quite sturdy. There are two different types of Spinthariscopes available. 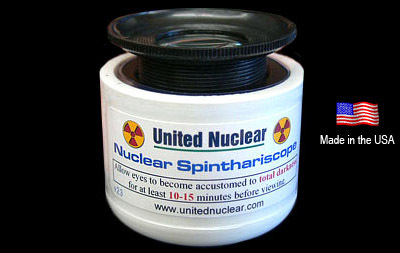 Our Nuclear Spinthariscope is our standard unit with a fixed source sealed inside. Our Super Spinthariscope has a knob on the bottom which allows the user to vary the distance between the source and target.